Long ago in a land by the sea, 12-year-old Aaron lives with his mother in the wooded countryside. Because the boy is mute, he depends on his mother completely. But when a sudden blizzard strands his mother in a distant town, Aaron finds himself alone for the first time in his life. Setting out in the snow to look for his mother, the boy embarks on a perilous, silent journey that will carry him to the eerie Half-A-Moon Inn. There, held captive by the sharp-eyed Miss Grackle, Aaron will discover her wicked powers-ones that Aaron must destroy if he is ever to see his mother again. 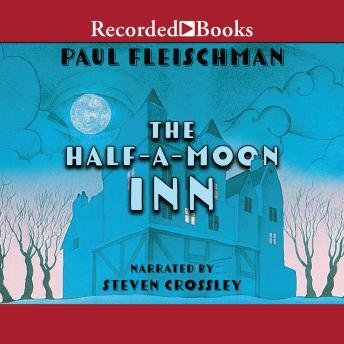 Paul Fleischman, an award-winning author of children's books, writes stories that capture the attention of even the most reluctant readers. Throughout Aaron's exciting adventure, The Half-A-Moon Inn fills with the sights and sounds of a magical, medieval world.